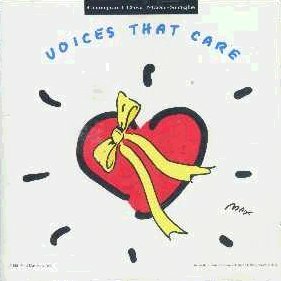 The song, Voices that Care, written and sung in support of the troops participating in Desert Storm (as well as the Red Cross) turns 20 years old today. The single was released on Feb 28, 1991. The song was performed by a “super group” of celebrity entertainers in much the same fashion as USA for Africa and Band-Aid. The recording of the single and the presentation of the video to the troops was filmed and presented in a TV Special that aired on Fox the same day the single was released. Participants in this “super group” included TWO members of New Edition (Ralph Tresvant and Bobby Brown), Garth Brooks, Celine Dion, Will Smith, Kenny G (yes, that Kenny G), Amy Grant, Michael Bolton, Luther Vandross, The Pointer Sisters and Peter Cetera. And like We Are the World, there were scores of random celebrities singing in the choir in the background like Alyssa Milano, Jon Lovitz, Clyde Drexler (? ), Chevy Chase, Jimmy Buffett, Nell Carter, Alan Thicke (? ), Orel Hershiser (? ), Brian Bosworth (? ), Mike Tyson (?! ), Don King (?! ), Lando Calrissian, Capt Kirk, The Fonz, Gary Busey, etc, etc. And check out much younger versions of Meryl Streep, Kevin Costner Kurt Russell and Michelle Pfeiffer (actually she looks exactly the same 20 years later). The video, like it’s predecessors, is a time capsule of Hollywood circa 1991. I’m not going to lie. I owned the Cassingle of this song. And I liked it. Actually, I still like it. It’s as cheesy as you would expect a song like this to be. Maybe even more chessy. Like, super hero cheesy. Everyone does the “hold one headphone to your head and sing into the microphone” bit you see in We are the World. You also get a lot of anguished looks to the side of the camera during singing. Michael Bolton is all Michael Bolton-y. It helps add to the mood and it gets me…right here *points at heart*. Oh, and Nelson showed up. I’m not entirely sure they were invited, but they showed up anyway. By the way, after you watch the video, in case you were wondering, the balding guy in the Elton John glasses at the very end of the song, the one you have no idea who that is…he’s the guy that sang the original demo that went out to all the celebrities. I always thought that was cool they gave him the last solo lines of the song. This entry was posted on February 28, 2011 at 8:00 am and is filed under music, nostalgia, pop culture with tags music, nostalgia, pop culture. You can follow any responses to this entry through the RSS 2.0 feed. You can skip to the end and leave a response. Pinging is currently not allowed. That last guy singing is Christopher Cross. “I always thought it was cool they gave him the last solo lines of the song.” Yeah, it’s always cool when they let one of the biggest singers of that time perform, isn’t it? Ha! He does sound like Christopher Cross! But it was actually little known Warren Wiebe who was a friend of the song’s producer and sang the demo they sent out to garner interest in the song. He died in 1998. And I wouldn’t say Cross was one of the biggest singers of “that time”. While he was certainly making music at “that time”, his last big commercial hit was 1983-1984, six or seven years prior.